The parameters that have the most significant impact on the quality of the solution are Population Size and Number of Iterations. In order to explore the effects of these parameters, we ran experiments on randomly generated trees of sizes 40, 60, 80, and 100, where problem size is defined as the sum of the number of tips in the host tree and the number of tips in the parasite tree. For each problem size, 90 random pairs of trees of that total size were generated using the COMPONENT package. and the trees were solved by Jane for a range of values on Population Size and Number of Iterations. The quality of a solution is measured by "cost ratio" where the cost ratio of a run is defined as the cost of the best solution found on that run divided by the best cost known for that tree after all runs. Error bars depict the standard error over all trees run with the given parameter set. Note that these results may not be representative of Jane's behavior on real phylogenetic trees since the problem instances were generated randomly. The number of "solves" (invocations of the dynamic programming solver) computed by Jane is the product of Population Size and the Number of Iterations. Jane's runtime grows linearly with the number of solves, but solution quality is also expected to grow as well. Once an acceptable number of solves is determined, one must choose how to distribute them between population size and number of iterations. A very large population does not allow time for iterative improvement and behaves as a shotgun method while excessively small populations may homogenize and fail to discover improvements. 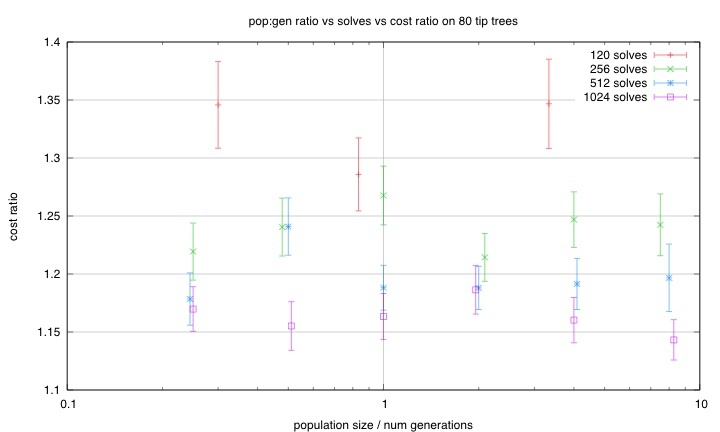 The genetic algorithm also uses parameters for selection strength and mutation rate. Experimental results demonstrate that these values have little effect on solution quality, so we only make them accessible to the user via the command line tool. The selection strength parameter defines how strictly the algorithm favors merging high quality solutions. The mutation rate parameter defines the probability that a population member will undergo a random mutation. Since the mutation procedure defined in Jane has relatively low influence on the solution, it is generally not a useful parameter.